"Matrix Revolutions" marks the third and final installment of the science fiction epic that began with "The Matrix." Laurence Fishburne continues his starring role as Morpheus, the keeper of faith, in a war that threatens the future of human civilization. "This movie reflects the world we live in," Fishburne tells The Early Show co-anchor Harry Smith. "The world is multicultural and multiracial and has women in it who do things that are not traditionally done by women and men in nontraditional roles. For example, Morpheus isn't in the driver's seat, doesn't have all of the answers and has to follow as opposed to lead." Fishburne notes the "Matrix" films have been designed for people who want to enjoy the ride, whether they desire to be intellectually engaged or not. For Fishburne, it definitely has been a ride. He has been acting since he was a kid, and he says his career has exceeded his expectations. He says, "It has turned out far better than I could have imagined, and that is because I put my faith and my trust in the Creator, and the Creator has carried me to this place, and I'm eternally grateful." Now that the trilogy is complete, he says he is "very pleased, honored, surprised." Who knew? Andrew and Larry Wachowski were not well-known prior to the film, Fishburne says, "Yeah. These guys from Chicago who were carpenters, who are brilliant writers, who have an incredible boundless imagination and they created this fantastic story, that seemingly has no end, although this is the end in terms of film." By recent accounts, Fishburne says there are 1,100 unofficial fan sites. Asked if he suspects the Wachowski brothers will make another film, Fishburne says, "I don't know if they'll make another one. But I do know that this story has really resonated for people all around the world, and I'm glad that I was a part of it." But this is not the end of the story. For the fans, Fishburne tells us the brothers are working on an interactive game that multiple players will be able to play on the Internet. 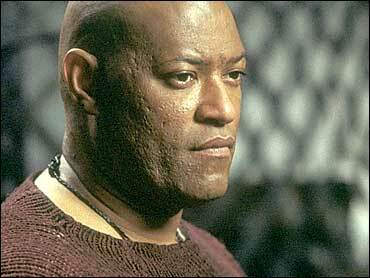 Laurence Fishburne was born in Augusta, Ga. on July 1961, but he was raised in Brooklyn, N.Y. In 1971, Fishburne made his professional stage debut as a young baseball fan in Charles Fuller's "My Many Names and Faces" at NYC's New Federal Theatre (date approximate). From 1973 to 1976, Fishburne portrayed adoptee Joshua West Hall on the ABC soap opera "One Life to Live"
In 1975, Fishburne made his film debut in "Cornbread, Earl and Me"
In 1979, Fishburne had a part in Francis Ford Coppola's "Apocalypse Now"
Fishburne had roles in other Coppola movies such as 1983's "Rumble Fish," 1984's "The Cotton Club" and 1987's "Gardens of Stone"
In the late '80s, Fishburne had the continuing role as Cowboy Curtis on "Pee Wee's Playhouse"
In 1986, Fishburne played Swain in Steven Spielberg's "The Color Purple"
In 1988, Fishburne had the role of Afro-centrist Dap Dunlap in Spike Lee's "School Daze"
In 1992, Fishburne won a Tony Award for his role on the Broadway production of "Two Trains Running"
In 1993, Fishburne earned a Best Actor Oscar nomination for his unflattering portrait of '60s pop star Ike Turner in the Tina Turner biopic "What's Love Got to Do With It"
Fishburne made screen history in 1995 as the first black actor to portray the Bard's Moor in a major studio film in Oliver Parker's "Othello"
Also in 1995, Fishburne made his off-Broadway debut as a playwright and director with "Riff-Raff", a loosely structured drama about an African-American con man; actor received an Emmy nomination for his role in the HBO movie "The Tuskegee Airmen"
In 1999, Fishburne enjoyed his biggest commercial success to date with the sci-fi movie "The Matrix"
In 2003, Fishburne appeared in the movies "The Matrix Reloaded," "Matrix Revolutions" and "Mystic River"